I really enjoyed this Hollywood love story. Justin, the Hollywood leading man with a horrific secret in his past, is a wonderfully constructed character. His life as an actor is exciting but isolating and Justin is ultimately a wealthy, famous, and very lonely man. George is his childhood best friend, the first boyfriend whose heart Justin broke when he ran away to LA. I love the contrast between solid, small town George and Justin’s mad Hollywood life. And I loved the connection that hasn’t faded between the two very different men. This story feels real and honest. This is almost completely angst free which is unusual for a Hollywood story. The star isn’t closeted and no one uses drugs or alcohol. The problems separating George and Justin are real and they both deal with their issues like grownups. I like the friendship between the two men and the sexual chemistry is very hot. The way Justin reacts to his past and responds to his father’s passing is very moving, and I really fell in love with his character. My only reservation with the story is a moment near the end. I couldn’t reconcile the quiet, private man I came to love through the story with the one airing his lifetime of secrets on live television. It is the only sensational moment in the book and it didn’t quite ring true for me. Otherwise, I really loved this story. Justin and George had a wonderful relationship growing up. They were able to be open, honest, and caring. However, both had to wonder where their lives would go. Justin had a rough childhood in that his parents were unable/unwilling to allow him to be himself. They didn't want a gay son. Justin just wanted the ability to love George. When the worst happens and Justin is thrown out, he only wants to run to George. However, due to circumstances beyond his control, he decides to run to Hollywood instead. There, he is able to make a name for himself, be himself, and not apologize for that. George is a small town guy through and through. He has lived a good life, helps people, and kind of just goes about his business. He has never forgotten his first love. In all reality, he never really got over his first love. George was lucky in that his parents were able to handle George being himself. They even told George that Justin could come and stay with them when he was turned out by his own folks. However, George never really understood what happened – Justin simply vanished and left him behind. When Justin's dad becomes ill, Justin comes back one last time to say goodbye. Justin's personal assistant and friend, Ethan, makes Justin face his father one more time – knowing that if he doesn't, he'll always regret it. I think I had the hardest time, like Justin, putting what people thought of his dad and his actions towards his only son together. They didn't match. Justin and George have to wade through a lifetime of hurt, sadness, and come out the other end with love still in their hearts. You get to witness a real relationship – there is no insta-love, no instant forgiveness. Rather, Grey makes the characters work for their relationship. This was heartwarming and I loved the realistic nature of the story. 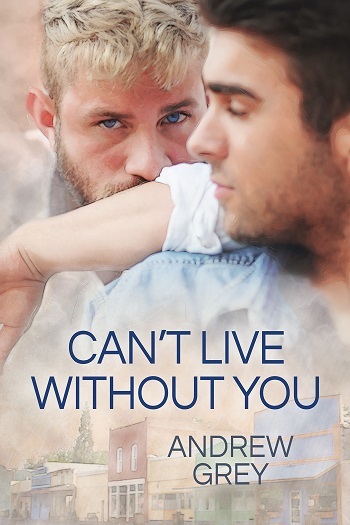 Reviewers on the Wicked Reads Review Team were provided a free copy of Can't Live Without You by Andrew Grey to read and review.